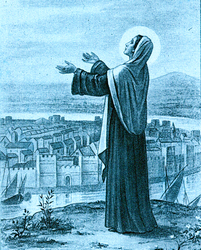 Saint Genevieve was born at Nanterre, near Paris. Saint Germanus, when passing through that village, noticed this little shepherdess and predicted her future sanctity. At seven years of age she made a vow of perpetual chastity. After the death of her parents, Paris became her abode, but she often traveled on works of mercy in which she was assisted by the gifts of prophecy and miracles. At one time she was cruelly persecuted. Her enemies, jealous of her power, called her a hypocrite and tried to drown her, but when Saint Germanus sent her some blessed bread as a token of esteem, the outcry ceased. Ever afterwards she was honored as a Saint. During the siege of Paris by Childeric, king of the Franks, Genevieve went out with a few followers and procured grain for the starving citizens. Childeric, though a pagan, respected her, and at her request spared the lives of many prisoners. When Attila and his Huns were approaching the city for another incursion, the inhabitants, instead of taking flight, asked her aid; and listening to her exhortations they undertook prayer and penance, thus averting the impending scourge, as she had foretold would be possible. Clovis, when converted from paganism by his holy wife, Saint Clotilda, made Genevieve his constant adviser, and, in spite of his violent character, became a generous and Christian king. Saint Genevieve died in 512, at the age of eighty-nine. When in 1129 a pestilence broke out at Paris, in a short time it swept off fourteen thousand persons, and, in spite of all human efforts, daily added to its victims. At length, on November 26th, the reliquary of Saint Genevieve was carried in solemn procession through the city. That same day only three persons died; the rest recovered, and no others were taken ill. This was but the first of a series of miraculous favors which the city of Paris has obtained through the relics of its patron Saint. My spirit hath rejoiced in God My Savior, because He hath regarded the humility of His handmaid.